The six-nation Shanghai Co-operation Organization (SCO) yesterday agreed to hold joint anti-terrorism military exercises next year in Russia as their defence ministers vowed to improve regional security. The plan was announced in a joint communique issued after a one-day Defence Ministers' Meeting of the SCO, which groups China, Russia, Kazakhstan, Kyrgyzstan, Tajikistan and Uzbekistan. The joint drills will be staged in the Volga-Ural military district of Russia, the country's Defence Minister Sergei Ivanov told a press conference following the meeting. He said the exercises were proposed by Russia and that troops from the six SCO member states would participate the first to involve all member countries. 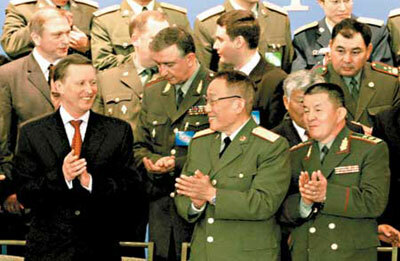 The SCO countries, except Uzbekistan, held their first joint anti-terror military drills in August 2003, with the first phase in Kazakhstan and the second in China. "The exact date, objectives and scale of the exercises will be determined by staff members and troop officers of the six countries," Ivanov told reporters, adding that the drills would involve the air forces, special forces and high-tech weapons. The joint communique said an expert group would be set up to co-ordinate the preparation and implementation of the war games. Russia's Itar-Tass news agency later quoted Ivanov as saying the exercises could simulate one member country being attacked by armed groups, with the other countries in the organization coming to its aid. "The armed forces of SCO member states should, if needed, help neighbouring nations block and possibly destroy large armed groups," Ivanov said, according to Itar-Tass. "The threat of SCO borders being crossed by armed groups is absolutely real." Chinese Defence Minister Cao Gangchuan stressed that the planned military exercises are not aimed at any third country. "We want to reiterate here that defence co-operation among SCO member states neither targets any other country or international organization nor hurts the interests of a third country," Cao said.